One platinum ring. 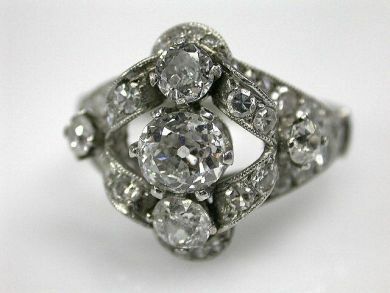 One old European cut diamond (1.47 carats: SI2 clarity: G-H colour). Two old European cut diamond (0.29 carats: SI-I colour: H-I colour). Twenty-six single cut diamonds (0.54 carats: SI-I clarity: H-I colour).